Magnetic Badge Holders, Magnetic Name Tags, Magnetic ID Cards With 3 Strong Magnets! The magetic badge holders, name tags or ID cards come with three very strong magnets. The three round steel metal magnets can hold your name badges, name tags or ID cards securely in place. 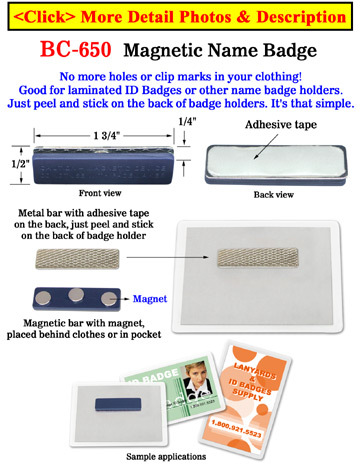 The magnets come conveniently with adhesive tape to attach to your name badges, nametags, ID cards or any laminated badge holders. Note: Badge holders, name tags or ID card holders are sold separately.